Before you get your telescope time and book an observing session, please read the following conditions of use. After 1 May 2014, we offer just one observing option, called service: observations are performed by the system, upon user request. Users can submit image requests at every moment, also during a given night, even a single image, providing details for them/it (date, object, integration time, filters and so on), via their personal page. The image will be taken as soon as possible, likely during the first available night. Users can even book specific time slots in advance, if something of interest for them will happen in that time frame. Each integration is considered at least one minute long. So, integrations shorter than one minute will be charged as ONE MINUTE each; longer integrations will be charged for their real duration. The telescope time going to be charged on the user credit is the time of integration of your expsure(s): time used by the system to slew to your object, as well as time taken by the system to download the CCD and so one, is of course not charged. Sessions booked in advance must be deleted at least 24 hours in advance, otherwise a 1-hour fee will be charged. Live mode users who will not show at the scheduled time will be charged for the whole session (the live mode is no longer available, but this rule is still present for transparency). Images are property of the user. In case of very important astrophysical targets/events, we can ask a given user to use her/his images, but final decision is up to her/him. Telescope time must be used within 1 year since your last purchase. 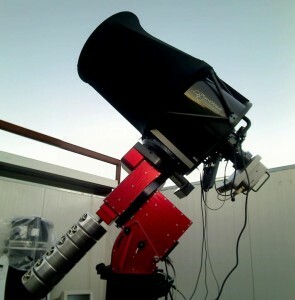 The environmental parameters are monitored by the supervisor, who eventually decides to close the observatory: in this case, only the used time will be charged. In case of bad weather or technical problems, the user will not be charged. The scheduled session can be cancelled at the last minute because of important astrophysical events: some variable star outbursts, transient pheanomena, unusual cometary activity, bright near-Earth Objects are Targers of Opportunity (ToO) for the Observatory. Images are retrieved by the user at the end of the session, once they will be available on our server for downloading. In particular circumstances the user can ask for real time image retrieval.